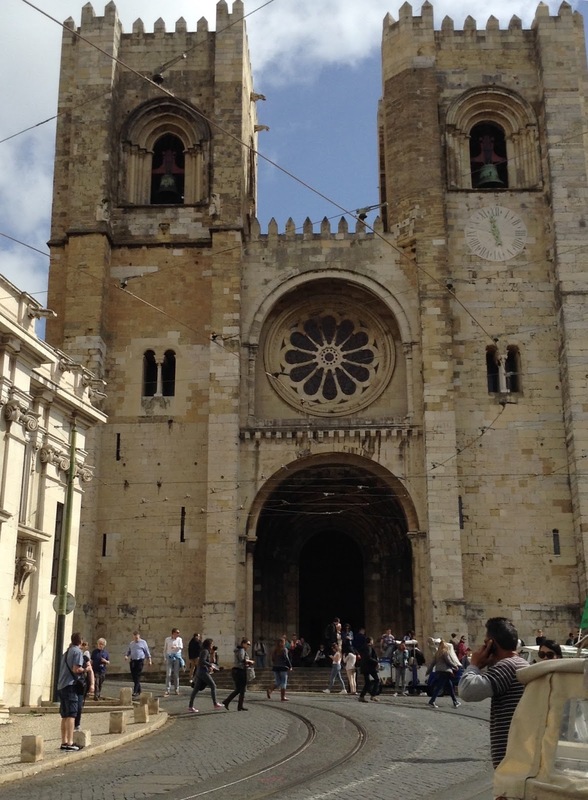 Among the few buildings that mostly survived the Lisbon earthquake of 1755 is the Cathedral of Santa Maria Maior. On the outside, it's built like a fortress, because there was an expectation that it might have to be used as one. It was thrown up in the 12th century, right after the European allies of the Second Crusade drove the Moors out of Lisbon and founded the state of Portugal in the process. Since the crusaders were an international bunch, the first bishop was a British guy, a monk by the name of Gilbert of Hastings. Needless to say, the cathedral was built on the site of the main mosque - there's no equivalent of the Mezquita de Cordoba in Lisbon. Inside, it's mostly in a nice plain Romanesque style, which I like although people who like it less might call it heavy. 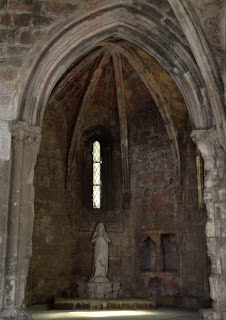 I think this gives the sense of it very well, although this shot was taken in the slightly later Gothic cloister. It's quite possible, mind you, that all this was once much more decorated. In the main church, someone went all baroquial on the main bit (that's a technical term). This garish stuff almost always seems less spiritual to me, especially when it's surrounded by sober monumental stone, but people at the time didn't think so. Adornment was a status symbol, a sign of worth and importance, especially if it was made with expensive materials and vast amounts of human labor. Anyway, I photographed some sweet little dragons for Antonia. Look how innocent this one is! I think it's supposed to represent the forces of evil or something like that. And this one's drinking nicely out of a cup in someone's hand! I think that might be St John the Evangelist, who was given poison by a pagan who wanted rid of him him to prove himself. So John turned the poison into a sweet little dragon and drank what was left in the cup quite safely.